When I was first introduced to the CHAMPs classroom management system, my first thought was that it was just another set of “classroom rules.” I soon found how wrong I was. If you’d like a proven way to enhance your classroom management system without a load of mind-numbing “training,” CHAMPs may be just what you’ve been looking for. And, it works like a charm for any subject area at any grade level—barring, of course, those little folks who have not yet learned how to read. 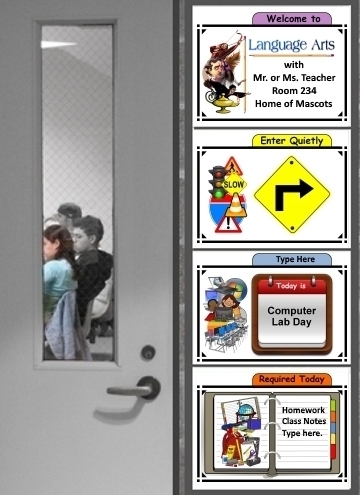 The free PDF’s offered on this page comes from a set of 100 classroom-ready signs that spell out your behavioral expectations for each of your specific classroom activities--small group work, study buddies, workshops, teacher-directed instruction, or virtually anything else that you undertake with your kids. In my mind, I think of the CHAMPs management system as a set of highly-focused, activity-driven, temporary classroom rules. When you switch activities, the expectations change accordingly. Consider, if you will, the following examples. When you present direct instruction to your kids, you sure don’t want them talking to each other, walking around the room, or leaving to go to the restroom. With the CHAMPs management system, you inform them of your behavioral expectations ahead of time for that particular activity. When you are supervising small group activities, however, you most certainly want your kids to talk to each other about the task at hand. So too, they may need to move around the classroom to gather supplies or sharpen their pencils. As you’ve noticed in both of the example displays above, the acronym signs along the left never change (although you DO have a choice of two styles as shown above). This is because CHAMPs defines five specific components of behavioral expectations for each successful classroom activity: Conversation, Help, Activity, Movement, Participation—all of which contribute to the “S” for Success. The signs along the right most certainly change with each type of classroom activity because your behavioral expectations are activity-driven. Now, I invite you to have a look at all of the specific signs included in the 100 CHAMPs Classroom Signs collection. The 18 available signs for Conversation are presented in the slide show below. The signs with blue boxes indicate areas of the customizable signs where you may type in any number of your own specific behavioral expectations regarding Conversation. As you may have noticed, all of the signs for Conversation have the same style frame. This was done purposely to serve as a way of correlating the expectations themselves with the acronym letter they are associated with. Here are the 12 signs for Help. 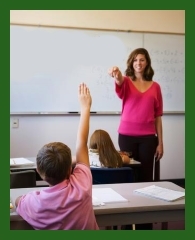 The “Stand Up a Book” help sign refers to a silent signal for help that does not involve waving an arm distractingly in the middle of the classroom. The student simply balances a textbook on its end and continues working while he/she waits for assistance. 7 of the Help signs are customizable. I know that some teachers prefer to use plastic cups—down-turned on desktops when no help is needed and reversed when they require assistance. Whatever your preferred method is, the customizable blank frame (included for each letter in the CHAMPs acronym) gives you the opportunity to specifically spell out your procedure for students seeking help. Again, the frame style for the Help signs match, making it easier to correlate the expectations with their associated acronym letter. There are 15 signs for Activity, and 7 of these are customizable (blue boxes are the typing areas). I neglected to mention earlier that each set of expectations comes with your choice of two types of acronym letter signs—one is a bit fancier and the other is more toner-friendly. Which one you choose is entirely your call. Here are the 13 signs for Movement—2 of these are customizable. Needless to say, there are a number of ways in which students participate in class. With that in mind, there are a full 17 signs for Participation, and 7 of them are customizable. And, then proceed down the signs in the order they appear. As you might imagine, the number of class activities is nearly boundless. Knowing the impossibility of covering ALL class initiatives, I included 8 customizable signs for success—7 of these allow you to tailor the name of the initiative with the clip art provided, and 1 blank frame in case the clip art does not fit with the initiative you have in mind. And, there you have it—100 CHAMPs Classroom Signs! I would strongly recommend, as I did on the previous page regarding CHAMPs, using 8.5 x 11 card stock paper (65 to 110 pound, thick paper) for printing the signs. Once they’re printed, consider attaching them to the classroom whiteboard with fasteners that can be removed easily (adhesive on one side and magnetic on the other). These inexpensive fasteners can be purchased at your nearest office supply store. Or, if you prefer to display them on a bulletin board, I’d recommend adhesive Velcro fasteners—one square in each corner. Following either procedure above yields a set of displayable signs that will last for at least an ENTIRE school year—perhaps longer. After all, they’re durable, reusable, and you’re the only one who will be handling them. Because they have such a long life, I would highly recommend printing all of the signs in color. These signs will really pop when they’re printed in color. You know, as well as I do, how compelling color is to the human eye. If color is not an option, these signs will still fit the purpose and look presentable wherever you choose to display them. I have found that involving the kids in the development of the expectations themselves goes a LONG way toward insuring the success of the CHAMPs classroom management system. This makes the 33 customizable signs particularly well-suited for this initiative. When you toss out questions to the class, such as, “What would be appropriate behavior to expect when we are reading silently?” Or, “What would be inappropriate behavior to expect during silent reading?” You’ll be amazed at how mature and logical their responses are! Of course, you can always steer their responses by probing, prompting, and reasoning with them—all of the things you do so well with them already. List their responses, one by one, on your whiteboard, or type them into a word processor connected to a digital projector as you brainstorm. When they see for themselves that their responses are, in fact, logical, reasonable, appropriate, and mature, they will buy into it. They will adopt their own expectations as the laws of each classroom activity. The potential pitfalls involving the CHAMPs classroom management system are limited, but nevertheless, they need to be mentioned. 1. Starting Time. This system works best if it is implemented on the very FIRST day of school. If you are introducing it later in the year, the overall success of this approach is entirely dependent on how well you handle it with your kids and how much you allow them to buy into it. One tool that may facilitate the launching of CHAMPs in the middle of the school year is CHAMPs Companion, an 18-20 minute video book that introduces CHAMPs to students. 2. Include Student Input. If you allow the kids to formulate, with your guidance as outlined above, the behavioral expectations for each classroom activity, they will feel ownership in the approach and will be much more likely to abide by their own rules. If you present your expectations as predetermined requirements, you can still make this work, however. Obviously, how you institute this management system is entirely up to you. 3. Sign Changing. More than one activity within one classroom session would necessitate a modification in behavioral expectations, and as a result, would require a change of at least five of the signs. You can handle this efficiently in one of two ways: change the signs during the transition from the first to the second activity yourself, or select a dependable student (with clean, careful hands) to handle the change for you. As you might imagine, pre-selecting the necessary signs for each of the two activities coupled with the matching frames for each of the CHAMPs acronym letters should make this a quick and straight forward task. 4.Establish Consequences. Finally, like any other sort of classroom management plan, this one has to have some teeth behind it. There just simply have to be consequences for non-compliant knuckleheads. Your school’s or team’s progressive discipline plan may have to be invoked. If you’d like more information about formulating such a plan, I would encourage you to reference this page. Bottom line: Implementing this plan on the very first day of school by involving the students in the decision-making process in the formulation of expectations is a nearly foolproof way of ensuring success. Sure, it takes a little longer to launch a cooperative teacher-student initiative such as this, but the time spent doing it will repay you over and over all school year long. These signs are available solely for two purposes: they give you an opportunity to evaluate the quality and potential of this approach, and they familiarize you with the simple process of customization. Basically, if you can use a computer mouse and a keyboard, you will not have a problem with customization. If you would like these 10 signs PLUS the other 90 presented on this page, you may want to download the 100 CHAMPs Classroom Signs Collection. This collection includes ALL 100 PDF CHAMPs Classroom signs in full color, exactly as seen on this page. You may want to get a quote on a School License and share the 100 CHAMPs Classroom Signs collection with your entire faculty at a discounted price! Both the free and full versions come with a clickable table of contents for locating specific signs quickly and easily. In addition, a Thumbnail Index of Customizables is included for your convenience. These collections are entirely compatible with both Windows and Mac. Additionally, 68 of these signs will accept your own typing, insuring that what you post on your walls and whiteboards reflects your own unique circumstances. See complete details here where you may download the Free 12-Sign Sampler, or purchase 125 Classroom Signs for Structure and Organization. I always believe in giving credit where credit is due. Over the course of the last few years, several of our colleagues have requested a collection of CHAMPs classroom management signs. I thank each of you for, at last, putting me to the task. In particular, I thank Naomi Foote, one of our fellow elementary teachers, who was kind enough to share the seed ideas for this endeavor (along with several clip art images from Santa Maria Elementary School). Although I was not able to identify the specific person(s) who was/were responsible for the images, I thank them nevertheless. Finally, the classroom clip art of Phillip Martin at ppst.com, in my humble opinion, is uniquely superb. All of the images that he created in this collection are duly cited at the bottom of each sign upon which they appear. Again, my sincerest thanks to all of you.